Well, OK, maybe we are…but it’s really NOT for the reason you may think! It’s really for your own good. Actually it’s more for your hair and your wallet’s own good! You might think that we (stylists) are always trying to sell, sell, sell to make a commission from the products you buy from us. Truth is, we do get a small percentage of our retail sales, but it’s nothing compared to what we can be making by putting out amazing color for our clients, teaching them the proper way to care for their hair at home, and having them send in their family and friends to us to get some amazing color of their own! That’s where it’s at…making you a walking advertisement for our craft. That’s how we thrive and survive as stylists. Think about it. You invest lots of time and money to get that perfect shade you’ve been working towards (or in some cases, trying to get rid of ) for the last 6 months. Each time you go to the salon you find yourself dropping upwards of $150-$250+ to get to your hair goals. Why on Earth would you invest all that money on your hair only to skimp on what you are putting on it at home? Why wouldn’t you want to protect your investment? Most salons will also allow you to return a gently used product if it does not perform the way you expected it to and will be happy to help you find a replacement that you will be happy with. A stylist can show you what products to use together, how much of each product is necessary (and not necessary) to achieve your salon results at home, and answer any questions you have about a product. We are your personal stylist after all. No really, you can’t! 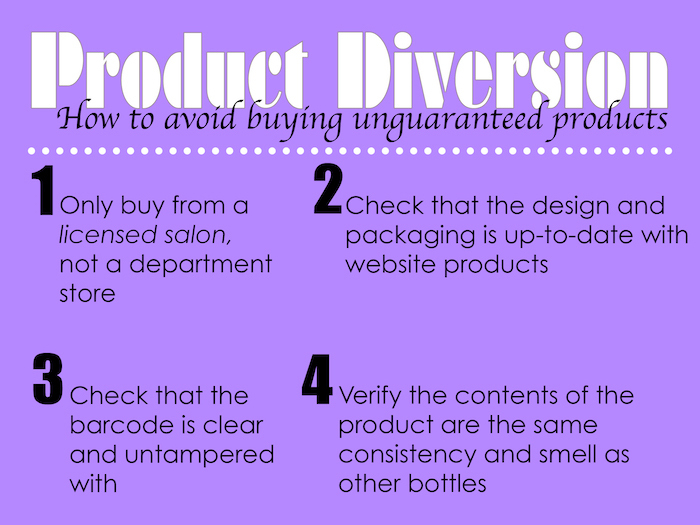 Salon brand products that you find online or at your local drug/grocery store are diverted products. Diversion is when an unauthorized vendor sells professional product lines they purchase on the grey-market and resells them. These products are often counterfeit, stolen, or outdated merchandise. Deep discount stores, drug and grocery stores will often buy a huge lot of salon products from a distributor, or a salon that goes out of business and then set the products aside in a warehouse for years until the barcode expires so they can’t be tracked. Then they slap a new barcode sticker on top of the old one and sell it as new. By this time, the product breaks down, can become contaminated with bacteria, smells funky and does not perform the way it was intended to. Believe it or not, people have even been known to dumpster dive at places like Sephora, Ulta, and other beauty supply stores. They find expensive products in the dumpster and resell them as new on eBay and Amazon. They have been known to add stuff to the bottles so they appear full and then sell it for the same price, and sometimes even more than the salon would. Now ask yourself, do you really want to use inferior products on that expensive color you just invested in? We didn’t think so.